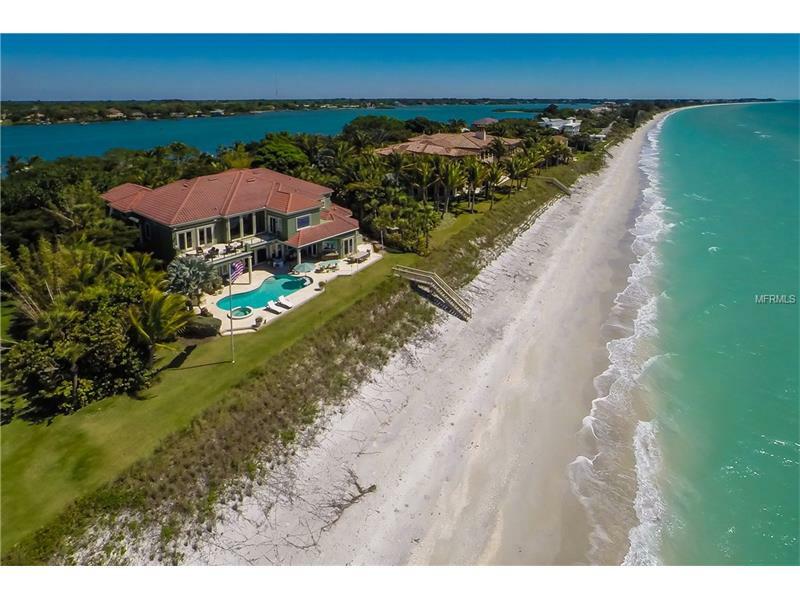 Privately nestled within lush tropical foliage on the exclusive barrier island of Casey Key, this direct Gulf front estate embodies a lifestyle of casual elegance. Built in 2001 and custom remodeled by the current owners in 2006, the expansive 9048 square foot, six bedroom, five bath, and two half bath floor plan features luxurious custom finishes and architectural design touches that blend seamlessly with an Old Florida ?? ?living at the beach??? ambiance. The main floor is centered by floor to ceiling views of the Gulf of Mexico, and offers a chef grade kitchen complemented by an adjoining cozy breakfast nook and a sitting room area, a huge laundry room that doubles as a storage space for kitchen and household items, an octagonal shaped formal dining room, a 500 bottle walk-in wine cellar, two stately offices, a fully equipped movie theater, and a complete mother-in- law suite. A grand double staircase leads to the guest bedroom suites, bonus sitting and study areas, and the Master suite. The Master bedroom accentuates the Gulf views and connects to an outdoor private suntan terrace, and offers two huge walk in closets and a fully appointed bathroom. Outdoors, relax in the heated saltwater pool and spa and enjoy the outdoor kitchen and shaded sitting areas just feet away from the private beach and brilliant Gulf waters. An easement allows for access to the Intracoastal Waterway & leads to a 24,000 lb. boat dock complete with electric & water, making the property a true ?? ?Gulf to Bay??? experience!